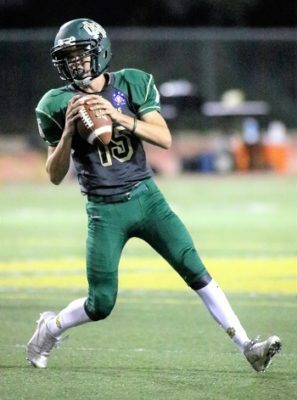 Mira Costa’s football team got back on track Friday evening after playing close, non-league contests that resulted in a win and a loss. The Mustangs (2-1) made the short trip to El Segundo where the visitors capitalized on Eagle mistakes to take an early lead and never looked back finishing with a 42-21 victory. Mira Costa quarterback Nick Carpino was involved in all six Mustang touchdowns, passing for three and running for three. The Mustangs took advantage of two Eagle mistakes to take a 14-0 lead in the first six minutes of the game. After a bad snap on a punt, Mira Costa had a first down on the El Segundo 37-yard line. Carpino connected with receiver Brody McKinnon for a 21-yard touchdown then, after recovering a fumble on the Eagle 34-yard line, Carpino took the first snap and bolted to the end zone. El Segundo (1-2) mounted a 75-yard drive to close the gap but Mira Costa answered with an 18-yard touchdown run by Carpino to give the Mustangs a 21-7 lead at the end of the first quarter. McKinnon caught a 26-yard touchdown pass to give Mira Costa a 28-7 lead at halftime. He scored on another reception in the second half finishing the game with 10 receptions for 110 yards. Carpino scored three touchdowns on the ground while passing for 216 yards in the game. El Segundo quarterback Matt Romero finished with 201 yards and two touchdowns through the air. Mira Costa will make a short journey on Friday to take on West Torrance (1-2). The Warriors’ 23-0 win against Santa Monica was sandwiched by losses to Culver City (62-20) and Tesoro (34-13). Redondo (1-3) traveled across the country to win its first game of the season last Thursday, rallying from an 8-6 halftime deficit to defeat East Ridge of Clermont, FL, 30-14. Redondo Players of the Week included freshman quarterback Kaden Martin (Offense), sophomore defensive back Nik Florakis (Defense), sophomore punter Robert Baker (Special Teams) and junior wide receiver/defensive back Markeece Alexander (Scout “Eager Beaver”). Redondo has a bye this week and will host West Torrance on Friday, Sept. 21.